From Papua New Guinea, Medinilla ‘Gregori Hambali’ is a rare and unusual species. 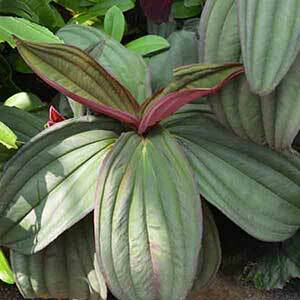 A tropical plant it is grown for the wonderful foliage, deeply veined, a felted green upper side and a muted red on the underside. To add to the interest it has pink flowers that will form along the stem beneath the foliage. This is another understory plant so it also needs a shaded position. It is also naturally epiphytic, so good drainage is essential. In cultivation it is usually grown in containers and a very open potting soil with good amounts of sphagnum moss mixed through is often used. Light tip pruning will give the plant a more bushy habit. Flowers – Pink forming along the stems. Foliage – Mid to deep green, veined with red undersides. This is a plant that is not readily available for sale and can be difficult to grow outside its natural environment.